Connect up to 100 network video recorders (NVRs) and digital video recorders (DVRs). • 64 encoders, and 256 directly connected cameras. • Supports 16:9, 4:3 and 9:16 corridor format aspect ratio video streams to be displayed on the same monitor. 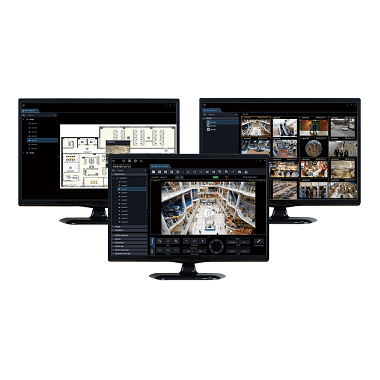 • All LIVE, MAP, and OPERATION monitors support 4K resolution for demanding high-resolution operation. • With the combination using i-PRO Extreme cameras and recorders provide full end-to-end AES-256bit encryption system with for mission critical applications. • Camera SD card full-encryption-video-recording on the edge can be quickly downloaded and decrypted under a secured environment.